The book is available directly from the publisher or from European retailers. American retailers will follow later. 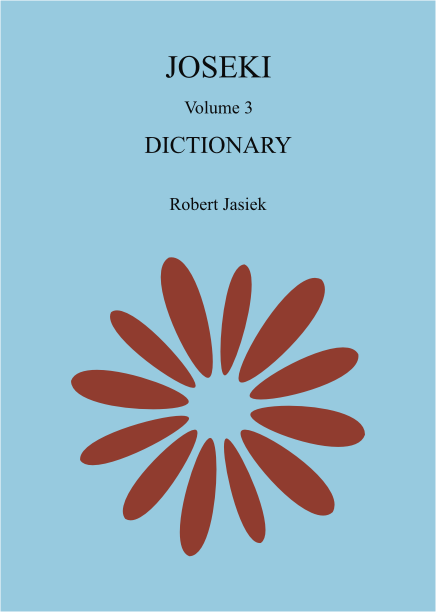 The author and publisher of Joseki / Volume 3: Dictionary is Robert Jasiek. The book is of A5 size, has 256 pages, has 5 diagrams per page on average, is written for players from 10 kyu to 3 dan and has the suggested price EUR 26.5. Among the genres of go literature, joseki dictionaries have the worst reputation: their purely tactical selection of countless variations suggests rote learning. Everybody knows that this does not work. Joseki / Dictionary breaks with this tradition to emphasise understanding. Strategy and evaluation are more important than minor tactical variety. Therefore the book explains all the josekis' strategic choices and reasons in the global positional context and evaluates their territory and influence. These aspects are so fundamentally important that the book sets a new standard for joseki dictionaries. providing all major reasons for decisions in the global positional context. Chapter 4 dominates the by far greatest part of the book's space. It contains the dictionary of 3-3, 3-4, 3-5, 3-6, 4-4, 4-5, 4-6 and 5-5 josekis. Its top level is organised in the traditional reference style by coordinates of the initial moves. After the very few first moves, structure relies on a different means: the major strategic choices. There are decisions such as sente or gote, upper or left side, thin or thick shape, territory or influence, favourable or unfavourable ladder, support or no support in the adjacent corner etc. The usual row of three diagrams shows the prior position, one follow-up choice and sequence, and the alternative follow-up choice and sequence. Every follow-up sequence has the moves until the subsequent strategic choice or the sequence's end. This structure greatly eases both understanding and learning because strategic choices are clearly distinguished from minor tactical considerations. The many inserted game examples enrich the text, show applications in the positional context, illustrate alternative variations or sometimes exhibit failures. Those diagrams show sufficient parts of the board or the whole board for understanding the reasons of choices. Where necessary, additional diagrams explain non-obvious tactics. Diagrams for ladders are put right after the strategic choices for such conditions. As for the strategic choices, the reader need not search but finds the relevant information exactly where he needs it. Nevertheless, the book comes with indexes for diagrams and keywords. Besides there are 33 mostly tactical problems. Databases of professional games have been consulted to distinguish modern from outdated variations, identify currently popular moves, verify the joseki sequences and identify the practically occurring reasons for strategic choices in the global positional context. Thus the reader profits from several weeks of empirical research by the author. One of the great hurdles for joseki learning is the difficulty of recognising a joseki's functions. Chapter 2 classifies the types of josekis, characterises every type, studies typical strategic choices and provides the relation to relevant reasons for the strategic decisions. For example, there is the type 'mutual running fight' and the reason to 'make territory during the fight'. The chapter is as simple as valuable; its fundamentals are learnt easily. Have you ever wondered whether a sequence creates a joseki or why traditional dictionaries do not tell you the why? Chapter 3 gives the answer by inventing the necessary theory! With a bit of practice, a player's current territory can be counted. Usually, assessing influence is even easier: count a player's number of influence stones, then compare Black's and White's numbers! The theory tolerates small calculation mistakes. Needless to say, one must also know whether both players have played the same number of stones in the corner. Josekis are classified according to their values of territory and influence. Without a proper balance, a result is 'favourable for a player'. The book offers solutions also for sequences in which a player has played one or two stones more than the opponent. The age of alchemy ends - now everybody can evaluate josekis! Why would a player learn josekis from a purely tactical dictionary consisting of two or three volumes? Surely he does not want to maximise his necessary effort, doesn't he? The author firmly believes that a dictionary consisting of just one volume suffices. What matters is rather how careful the dictionary's josekis have been selected. Probably Joseki / Dictionary with its 400 josekis and 130 (mostly professional, a few top amateur) game examples can serve as the only joseki dictionary a player needs for his go career. A beginner finds the simple variations, a kyu player finds exactly the practically relevant variations and a dan player finds the most frequent of the modern, recently invented josekis. When a player understands the book's variations, he will be prepared to rediscover or invent further josekis by himself. Although Volumes 1 and 2 provide all the background go theory, Volume 3 presumes comparatively little prior knowledge. The essential terms' definitions of the preceding volumes are repeated. For a truly profound understanding, it is recommended though that the reader has at least a rough idea of development directions, sacrifice, large scale cuts and aji. In other words, a player profits the most by understanding well both strategic concepts and josekis. Volume 3 can be read independently, but a kyu player wishing to reach dan level some time cannot circumvent strategic concepts forever. Joseki / Dictionary can be used as a textbook or a reference. It serves the joseki learning of players from 10 kyu to 3 dan while they get a very thorough understanding. Evaluation adds another layer to the book; players below 5 kyu can postpone chapter 3 and the values in the diagram captions. Since the strategic choices, evaluation, classification and reasons explain the core missing in purely tactical dictionaries, they can be understood better while consulting Joseki / Dictionary. Players from 4 to 5 dan can complete their knowledge gaps related to modern josekis not existing in their older source. For yet stronger players, the evaluation method is new. Volume 3 does not repeat the go theory of Volumes 1 and 2. Since Joseki / Dictionary offers the most important tactical variations but presumes the reader's ability to find the easiest alternative tactics by himself, probably the book is not suitable for those double digit kyu players still having basic tactical difficulties. Joseki / Dictionary does not compete in terms of numbers of tactical variations, as found in detailed purely tactical dictionaries such as the Nihon Kiin's Joseki Dictionary. Joseki / Dictionary has intentionally skipped most of the too complicated, rare branches.